For panels, the program automatically assigns the names PNL-1, PNL-2, PNL-3, and so on. The base kV of the panel. The service for the panel. Select from 3 Phase - 3 Wire, 3 Phase - 4 Wire, 1 Phase - 2 Wire, or 1 Phase - 3 Wire. See Panel Row Behaviors for more information on how the service selection affects the panel rows. Note: To use the Single Phase Panel Schedule Template on the panel, select either of the 1 Phase options. See File-Specific Templates for more information. Upstream Rating The minimum amp rating of equipment that is upstream from the panel (such as breakers, transformers, or cables). This information is for reference in certain specific configurations of EasyPower and is not generally visible. See Configuring the Spreadsheet View for information about these options. Tools Use to enter tool information about the panel. See Edit Tools for more information. Unit Choose either U.S., Metric, or CSA. 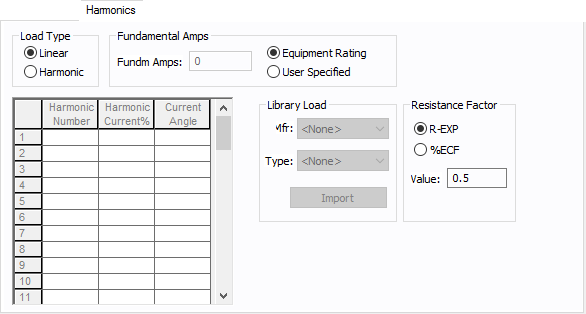 Mfr Use this text field to describe the panel manufacturer. Type Use this text field to further describe the panel manufacturer model. Material Select the material for the panel, from aluminum, copper, or other. Main Bus Rating (A) The current rating of the main bus. 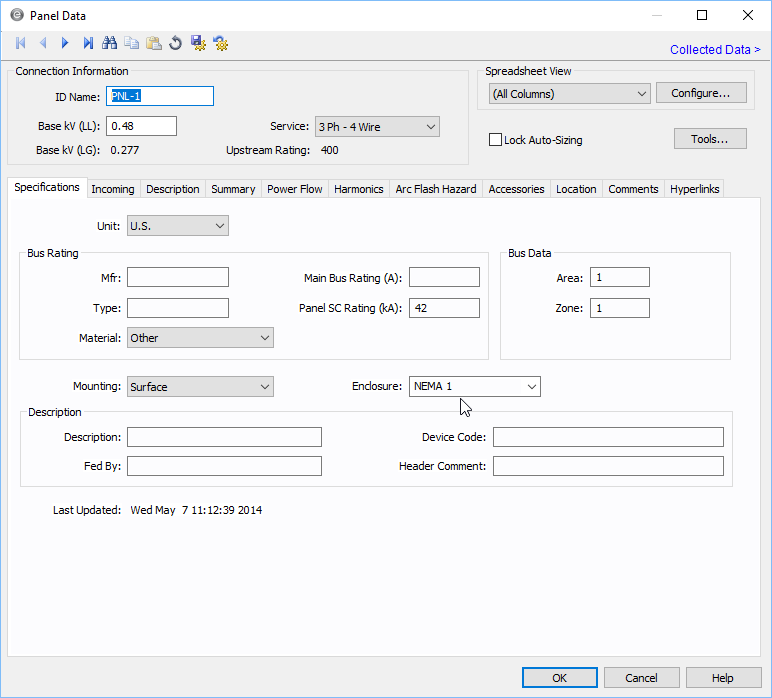 Panel SC Rating (kA) The rating of the bus used in calculating the short circuit duties for SmartDuty™. Mounting The mounting for the panel. Select from flush, surface, or free standing. The enclosure for the panel. If the panel units are set to metric, this represents the International Protection Code. ANSI: Select from NEMA 1, NEMA 3R, NEMA 4, NEMA 7, NEMA 9, or NEMA 12. If the panel units are set to metric, you can manually enter the enclosure or code by typing it. IEC: You can manually enter the enclosure or code by typing it. Description Use this field to describe the panel. Fed By Use this field to indicate the transformer or the power supply source feeding the panel. Header Comment Use this field for any comment on the panel. Last Updated The date and time the panel data was last updated is displayed here. Main Breaker: LV breaker protects the panel bus. You can select the breaker in Incoming Device Settings. Main Fuse: Fuse protects the panel bus. You can select the fuse in Incoming Device Settings. Incoming Branch You can select the incoming branch equipment such as cables, transformers or busways. All the branches connected to the panel in the one-line are displayed in the list. Incoming Device Settings Opens the data dialog for the main fuse or main breaker that has been specified as the incoming device type. Refer to Low Voltage Breaker Data or Fused Switch Data for details. Device Information Information on the selected main breaker or main fuse. This is a spreadsheet listing similar to the Device Library. When you place a new panel on the one-line, the first time you open its database dialog and click on the Description tab, EasyPower displays the Panel Schedule Spreadsheet Creation Wizard which enables you to select the number of rows you want. Clear the check box at the bottom of the wizard dialog if you don't want it to appear with each new panel. Library The list contains all of the same schedules as the Device Library. To enter a listing other than those contained in the list, create a new page in the panel section of the Device Library. Schedule This list enables you to specify in which Device Library Schedule your chosen Library Load spreadsheet is located. To enter a listing other than those contained in the list, create a new page in the panel section of the Device Library. Panel Load Units Select the panel load units, from VA or Amps. View These options enable you to choose which of the panels you want to view: detailed left, right or both. The choice Simplifiedshows the ABC buses in the middle with the loads on both sides of the spreadsheet. ECR Type This is a reference for a type of electrical change request. It is only used in very specific configurations of EasyPower and is otherwise unavailable. Preassigned Indicates if a change request is pending for this item. It is only used in very specific configurations of EasyPower and is otherwise unavailable. Library Load This list corresponds directly to the Library Load column in the Device Library. After you have made selections in the Library, Schedule and Library Load fields, all of the following data cells are automatically filled in as soon as you click on another cell. You may also double-click on the cell to enter something different than what is listed. Status The column is a toggle "On/Off" to indicate if this particular item is currently connected to the panel. Turning any load as “off” is similar to deactivating them in the one-line. Load: Specify loads in kW and kVARs. Motor: Specify motor HP or kW and X/R ratio. Sub-Panel: Specify the ID Name of the connecting cable and the sub-panel. Facility The facility (building) for the panel row. Facilities are set up on the menu beneath Tools > Options. Location The location within the facility for the panel row. Locations are set up on the menu beneath Tools > Options. Floor The floor of the facility where the panel row is located. Floors set up on the menu beneath Tools > Options. For notes on panel spreadsheets, see Panel Spreadsheet Notes. For panel row behavior, including how to insert, move or delete rows, see Panel Row Behaviors. 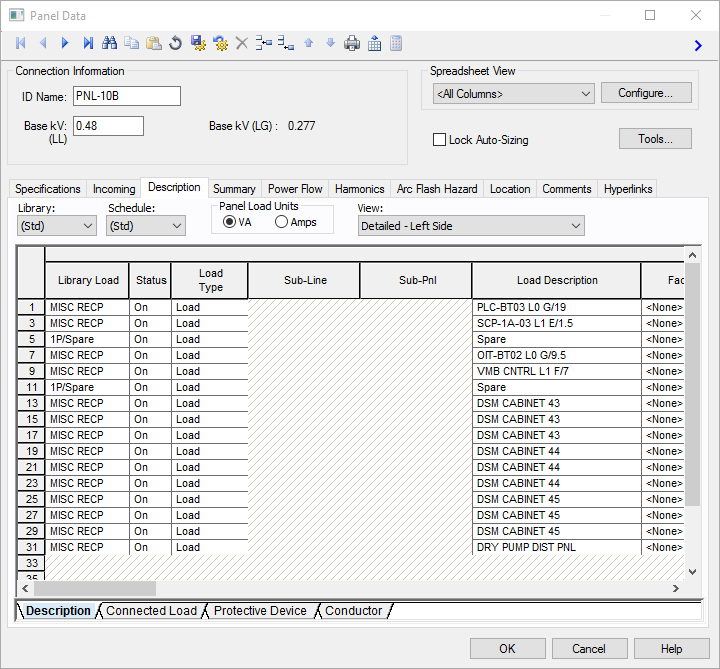 The summary tab sums all the connected loads and displays results for total connected, demand, code factor and design. There are two sections in this summary: Panel Load and Including Downstream Load. 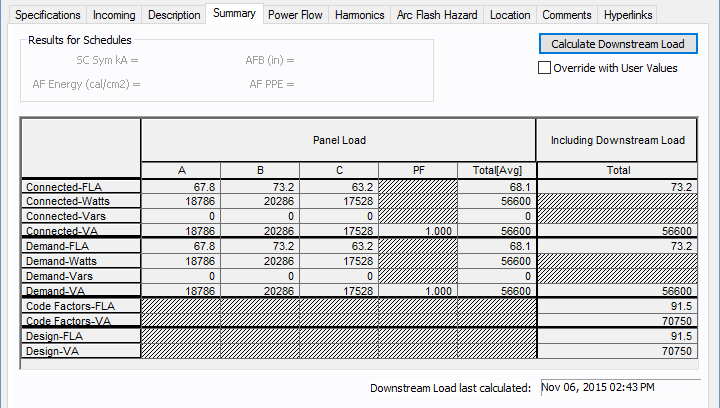 Calculates the total load on the panel, taking into account the connected load, demand factors, and NEC code factors. Override with User Values This check box enables you to enter your own data. You can enter measured data or assumed data in the available fields. If this check box is not enabled, then the program calculates all the downstream loads and displays the total. For this feature to work, it is necessary to have a source upstream to the panel. This feature is applicable only to radial distribution systems. Downstream branches with any power source are not accounted for. This summarizes the loads fed directly from this panel. It does not include loads fed through downstream sub-panels. These are not user-definable fields. They are updated automatically when you make changes in the spreadsheet of the Description tab. The watts and vars shown in this table do not reflect the downstream load of the sub-panels. Including Downstream Load Loads connected through downstream sub-panels and buses are summarized in this section. Load Model Enables you to select the panel kVA from the Specified data or from SCADA (Supervisory Control and Data Acquisition) data. SCADA data can be read in by clicking File > Import. 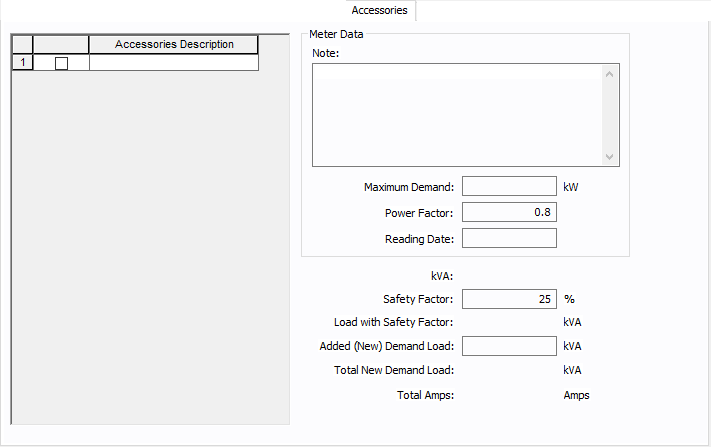 Connected: The kVA is determined by the load defined on the Description tab of the panel. Demand: The kVA is determined by the demand factor. Demand factor is calculated as the maximum loading conditions divided by the total connected load. This is specified on the Description tab of the panel. Code: The kVA is determined by the code factors. Code factors are derived from the factors set up in the database File Properties on the Code Factors tab which reference NFPA 70 (NEC) article 220.40. You can view or edit the codes on the Description tab of the panel. Design: The kVA is determined by the design factor in combination with the code factors. Design factor is set up in Tools > Options on the Equipment tab. You can view or edit the design factor on the Description tab of the panel. Panels can be modeled for the power flow solution in several different ways. Constant kVA: This is the most common model. It is conservative, and will result in slightly lower voltage values than would be measured on an actual system. Constant Current: This model alone is generally not used for power flow simulation. Constant Impedance: This model is for loads such as incandescent lighting, ranges, and resistance space heaters. Scaling factor Provides an easy way of adjusting the total panel load used in determining power flows. SCADA data can be modeled in the power flow solution in several different ways. SCADA load type is set in the ASCII file, and can be changed by you. Scaling factor Provides an easy way of adjusting the total SCADA load used in determining power flows. By changing the scaling factor, the actual kW +j kVAR read in from the ASCII file remains static; however, the load used in the power flow is adjusted by this factor.